Discussion in 'iPad Accessories for iPAD 1, 2 and 3' started by xune, Jan 6, 2011. We're live at CES this week, and things are kicking off here in Vegas. The show floor itself opens tomorrow, but electronics manufacturers have already started up with all of their announcements and reveals showing off all of the new hardware for 2011. 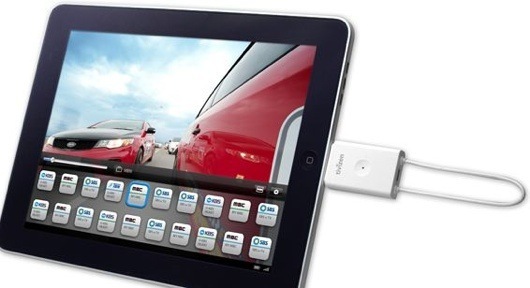 Here's one interesting gadget: the Tivizen is a device created by Korean company Valups which plus into the iPad's dock connector, and along with a free app, allows for the iPad to recieve digital over-the-air broadcasts of television. That's pretty handy -- depending on standards and availability, you should be able to watch most major broadcast channels in large US metro areas directly on your iPad. The Tivizen is priced at $99, which puts it in line with something like the EyeTV. Hopefully not for too long, though -- the device requires its own battery, which only lasts a couple of hours. If you've been looking for a way to watch a broadcast show you can't otherwise see, specifically on your iPad, the Tivizen might be just what you're looking for. Odds are there's some other way to watch that video on Apple's tablet, no? Not the most attractive of accessories imo. I'd like this more if it were redesigned as a right angle kickstand, with the antenna as the stand. Still though, it's intriguing. > Edit: for something similar that doesn't stick out the side of your iPad, go 3 posts below. A bit pricey, and it should be powered by the iPad.....since it says only a few hours of battery life....but damn thats cool!! It may look vaguely like an accessory to a late-80s PC that's sprouted antennas, but Hauppauge's new "Broadway" live TV streamer does have a few more modern tricks up its sleeve: it can stream live TV to your iPhone or iPad. That can be done over WiFi in your house or over the internet anywhere else, and the device packs a multi-format receiver that can tune in both digital cable TV channels and ATSC over-the-air broadcast channels (or analog TV, for that matter), which are all conveniently compressed for streaming. Hauppauge Digital Inc. (NASDAQ: HAUP) is the leading and largest developer and marketer of analog and digital TV Tuners for the personal computer market. These tuners allow personal computer users to watch TV on their computers. The company has introduced its new product for Apple (Nasdaq: AAPL) gadgets, spurring a flurry of trading. Hauppauge introduces a new way to Watch live TV on an iPad or iPhone with Broadway. You can watch local news, sports events, or any other live TV programs in your home, or anywhere in the world on an Apple iPad, iPhone, or iPod touch. definitely interested since i don't have cable lol. so, it seems you don't need cable and it's a one time purchase for tv? wonder how many channels and etc it will have. The number of channels you can receive depends on how many DTV stations there are in your area. Agreed and this is a pretty good idea. so i read the Broadway live tv, hooks up to your cable, then transfers over digital wireless to your iPad. so you need to have your own cable, that's what channels your iPad will receive. how does the first one work? The first one works like an aerial antenna. In other words, it picks up your local channels. The US$199 device has a built-in HD H.264 video compressor, an ATSC tuner for local broadcasts and support for QAM digital cable, so if that's all you want, the box can be used on its own. It also allows hookup to your cable or satellite box. The programming you select can be viewed over Wi-Fi or the internet on any iOS device. Details are a bit sketchy, and despite the announcement at CES 2011, the Broadway hasn't even shown up on the Hauppauge website. It looks like a solid competitor to the Slingbox line, but we'll wait until we actually see one before making our mind up. The Broadway should be available in mid-February. anyone know if the ATSC version of tivizen has come out yet?